The iPhone SE, while more like the 5s in design, offers similar hardware to that of the larger, more expensive 6s. However, there’s no 128GB storage option, the phone features an old Touch ID sensor, and it’s missing LTE Advanced, which ultimately warrants its lower $399 entry price. On the other hand, for those already used to a smaller screen and looking for a budget-friendly iPhone that can capture 4K video and take Live Photos, the SE may be the right fit. Small pockets? Not a problem. Tired of one-handed typing? Two hands are fine. The iPhone SE’s small size goes back to basics — but does its resemblance to the 5s hurt its overall appeal? If you’re a fan of chamfered edges and a boxy appearance that dates back a few years, then no. 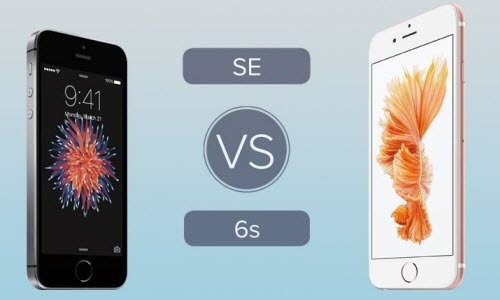 For those hoping for more visually appealing characteristics found in the 6s, the SE seems like a step backwards. To delve further into the size differences between the SE and 6s, the smaller SE weighs in at just under four ounces and is 7.6mm thick, while the 6s tips the scales at 5.04 ounces but is half a millimeter thinner at 7.1mm. Color options are identical between the two devices – each is available in Silver, Space Gray, Gold and Rose Gold. To gloss over the hardware similarities between the iPhone SE and 6s would be doing the SE a huge injustice. With a starting price of $399, which is 39 percent lower than the base 6s, the SE wins the affordability round. But while the SE is more like the 5s from a design perspective, the hardware is very similar to that of the 6s. Both feature an A9 64-bit chip, which Apple states is twice as fast as the iPhone 5s in CPU performance and three times as fast in GPU capability. The embedded M9 motion coprocessor found in the A9 also allows for “Hey, Siri” functionality in both phones. The iPhone SE is missing the 6s’ barometer, which allows it to count the number of floors climbed with its step tracker, among other capabilities. That omission may prove frustrating for fitness and outdoor enthusiasts. Overall, though, preliminary benchmarks do pin the SE right up there with the 6s in performance. As far as resolution goes, the SE’s small, 4-inch display outputs at 1136×640, while the 6s has a larger 4.7-inch screen that runs at 1334×750. Keep in mind, though, that while both devices have the same pixel density (326 pixels per inch), the SE has a far lower contrast ratio (800:1) compared to the 6s (1400:1). Let’s just say the $399 entry price helps make the SE’s lack of screen real estate easier to bear, especially if you’re looking to upgrade from a 5s. If you’re already used to a bigger screen, it’s tough to downsize. Featuring the same 12-megapixel (MP) camera as the 6s, the iPhone SE seems like a clear winner in this category due the lower price point. However, there’s a big different between the two devices when it comes to the front-facing camera. The SE has an older 1.2MP front-facing camera, while the 6s comes with a higher resolution (5MP) version. The result? Crisper selfies when using an iPhone 6s. Both smartphones do support Live Photos, however. When it comes to storage options, the iPhone SE offers two capacities: 16GB and 64GB. The lack of a third 128GB option, which can only be found in the 6s and 6s Plus, definitely limits the SE’s appeal. If you back up photos and videos to the cloud regularly, sure, 64GB may be enough space. But for many, the lack of a 128GB option is a deal breaker and keeps sales of the 6s churning. Another difference between the iPhone SE and 6s comes in the form of Touch ID. The SE utilizes the same first-generation Touch ID fingerprint sensor found in the 5s, while the 6s features a second-generation Touch ID sensor. The difference between the two? Speed. On the bright side, the SE does support Apple Pay even with its first-gen Touch ID sensor. No comparison between the iPhone SE and 6s is complete without going over differences in cellular technology. Plain and simple, the SE doesn’t support LTE Advanced technology, which is at least three times as fast as regular LTE. However, carriers haven’t exactly rolled out LTE-A technology across the United States in a speedy manner, and many users can only utilize LTE-A in major cities using select carriers. The lack of LTE-A support does make the SE less future proof, but with Verizon already announcing plans to test 5G service, this could be a moot point depending on your geographic location. The iPhone SE packs a lot of features into a device that’s competitively priced. Users looking to upgrade from a 5s shouldn’t have nearly as much trouble handling the 4-inch screen as those who have grown accustomed to a larger display. The lack of LTE Advanced technology and a 128GB storage option aren’t future proof, but if you’re sticking to a budget, the SE is a great way to get into a iPhone without breaking the bank. This entry was posted in Apple, iPhone 6S, iPhone SE, News and tagged apple, display, iphone 6s, iphone se, size difference by IosdroneD. Bookmark the permalink.